The problem was that the storm clouds that hung over the Group's operations in those years (2008-09 and 2009-10) had never really dissipated. The management too was conscious of it. But the Group’s response to the challenges facing them was along predictable lines. Their solution: undertake yet another round of ‘restructuring’, this time involving the consolidation of all broadcast operations under one roof. 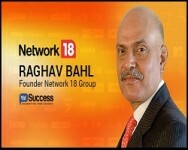 Global Broadcast News, which since the launch of its IPO had changed its name to ‘IBN 18 Broadcast’ was renamed as TV 18 Broadcast and the erstwhile Television Eighteen India with its business channels and assorted assets would merge into it. The process began in the second half of fiscal 2009-10 and was completed by 2011-12. - One, was the business fundamentals of both the companies. While TV18 was generating funds from its broadcast operations, it still needed to infuse funds in its affiliates to keep their operations going. In 2011-12 the company generated roughly Rs 242 crore from its business operations. But it also invested approximately 262 crore in its subsidiaries and affiliates (the joint venture with Viacom, principally) as its cash flow statement for that year showed. Taken together, there was no surplus to be found for servicing existing debt obligations, leave alone generating a return for investors on the monies they had invested. - Two, TV18 also needed additional funds to repay instalments of term loans and maturing public deposits if they did not get renewed. - Three, for NMIL, the problem was even more acute. Its day-to-day operations themselves were in the red, rendering the prospect of any cash support to its operating subsidiary TV18, remote. - Four, tapping existing shareholders or outsiders in the normal course of fund raising in the market wasn’t just difficult but practically impossible. The stock market had by then taken a rather dim view of the near-term prospects of both companies. The NMIL stock, which was quoting at around Rs 165-170 range in April 2011, had dropped to Rs 90 by August and was down further at Rs 35-40 per share by March 2012. The TV 18 stock did no better. It was down from around Rs 100 in April 2011 to Rs 23-30 by March 2012. - Five, the declining stock price performance of the company particularly hurt the finances of NMIL badly. The company, which had raised roughly Rs 300 crore from the promoters in optionally convertible debentures with a conversion price fixed at Rs 160.50 per share in June 2011, suddenly faced a situation of huge cash outflow as the promoters saw no merit in exercising the conversion option at well above the ruling market price. Consequently, they had informed the company that they were irrevocably declining the ‘conversion’ option (conversion to equity shares). They couldn’t be faulted. After all, why should they convert debentures into shares at Rs 160 per share when the same shares could be had in the market at Rs 30 per share? This meant that the promoters expected to be repaid the money that NMIL had raised from them by way of issue of debentures. "The promoters expected to be repaid the money that NMIL had raised from them by way of issue of debentures. " Since these debentures were issued with a tenure of 18 months, the company had to find another Rs 300 crore in additional funding during the financial year 2012-13 - a sum over and above whatever it needed to repay other debts. - Six, the promoters’ inability to infuse fresh funds by pledging their existing holdings and using those monies to infuse funds into the holding company or its operating subsidiary, because the bulk of it had already been pledged. In the case of NMIL, by March 2012, two-thirds of what the promoters owned was already pledged. They couldn’t afford to put any more shares on the block as they needed a cushion for any possible further decline in the price of shares as that would call for pledging additional shares as security. Given such a precarious financial situation something had to give. 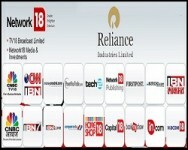 By 2012-13, resolution came about in the form of Reliance Industries (RIL) getting a foot in the door of Network 18’s operations. The ball was set rolling in January 2012 when both NMIL and TEIL announced that they were proposing to raise additional funds by way of a ‘Rights’ issue of capital to existing shareholders. There couldn’t have been a stronger signal that the promoters were ‘throwing in the towel’, as it were. For, this was no ordinary exercise of issue of shares to the existing shareholders that happens from time to time in a company’s history. It was an act that marked an inflexion point for the two companies involved and, more importantly, for who would get to control their operations. The very size of the ‘rights’ issue itself was a good pointer. TV18 and NMIL were planning to raise Rs 2,700 crore each, to more than quadruple the paid up capital base in the case of TV18 and effect a seven-fold increase in the case of NMIL. Related to that was the quantum of entitlement. At a time when companies issue such options in fractions of a unit of existing ownership or at best one for one, these two companies were offering four and six times their current ownership as ‘rights’ entitlement. Thus NMIL was offering shares on a ‘rights’ basis in the ratio of 307 shares for every 50 shares held while TV18 said it was offering 41 for every 11 shares held. Would it be reasonable to expect that public shareholders would subscribe four to six times their existing investments when the companies’ shares were doing so poorly in the stock market? Also, this was not a proposal to raise funds to tide over difficult times such as recession or a slowdown in the economy. Nor was it meant as top-up investment for some existing businesses that needed a little extra push so that they would take off in the years ahead. On the contrary, TV18 said that the bulk of the money raised would go towards funding a host of regional language news and entertainment channels belonging to the Eenadu Group. It was a proposal in which three-fourths of the money (for TV18 at least) would go towards expanding into wholly uncharted territory (non-Hindi regional languages news and general entertainment). Predictably enough, the ‘rights’ issue went through with substantial investments by promoters and, as events would prove later, the promoters’ contribution to the infusion of funds in the two companies was made possible only with the help of financial support from RIL. When the ‘rights’ closed in October 2012, the bulk of the shares in NMIL were picked up by promoters as other classes of shareholders, including the general public, did not subscribe to their full quota of shares. Consequently, the promoters’ stake in NMIL, the parent company, went up from 7.07 crore equity shares to 76.39 crore shares out of the total of 104.64 crore shares, thus giving them a 73% stake in the company, up from 48.30 prior to the ‘rights’ issue. At TV18, however, they picked up a slightly smaller number of extra shares over and above their quota of entitlement. This was because the public, mostly financial institutions and mutual funds, picked up their quota of additional shares. In the event, the promoters’ stake stayed at pretty much the same level as before. Over all, the two companies would go on to raise a little over Rs 2,075 crore in net additional funds. The amount in question is very substantial when measured against what the promoters’ had invested in these companies up until then. So the logical question is, how did they manage it? By tapping Reliance and the Independent Media Trust (IMT), as explained above. The terms of the agreement ensured that the investment companies were able to raise funds by floating Zero Coupon Optionally Convertible Debentures (ZCOCD) to the tune of Rs 2,200 crore and IMT subscribed to it. These debentures could be converted into shares of these investment companies by IMT at any time of its choosing. The conversion option was a potent instrument with which to alter the ownership character of both TV18 and NMIL. If, as a result of the infusion of fresh funds through the ‘rights’ issue, the operations of the two companies could be turned around to make them more profitable, then these investment companies would become worth a lot more than earlier. It would therefore make sense for IMT to exercise the conversion option and acquire ownership control in them. "The conversion option was a potent instrument with which to alter the ownership character of both TV18 and NMIL." 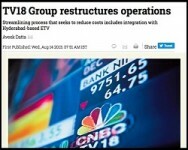 And if, despite the infusion of a large sum of money, TV18 and NMIL continued to flounder, then too the only way IMT could recover its investment in these debentures was to exercise the conversion option, ie become a dominant shareholder in those investment companies and try to monetise the broadcasting and digital assets of TV18 and NMIL. To argue therefore that the ownership structure in TV18 and NMIL underwent a transformation only in July 2014 - the month IMT actually exercised its right and not at the time when monies were pumped into these investment companies back in 2012 - is facile. Things had changed in a decisive manner from the moment money from Reliance (routed through a trust) was used to fund the massive infusion of capital into these companies in October 2012. Was the complex corporate structure responsible for management losing the plot? How did it come to this? Did the management make things difficult for itself from an ‘oversight’ perspective by resorting to a complex corporate structure for various businesses under its command and losing the plot altogether? The Group had a parent holding company, Network 18 Media and Investments Limited. The television business was controlled through TV18 Broadcast Limited in which NMIL had a majority stake. But its venture into Marathi language news was operated through a separate company in which TV18 had a 50% stake (IBN Lokmat). The general entertainment channel Çolors was housed in Viacom18 Media Private Limited which again was a 50:50 joint venture between TV18 and Viacom. The joint venture company in turn held 100% stake in the Indian Film Company that was into production of feature films. Similarly the infotainment channel such as the History channel was operated through a 51% subsidiary of RVT Investment, which in turn was a wholly owned subsidiary of TV18. The chart below gives a schematic view of the network of companies that constitutes the Network 18 Group (See Chart 2). In theory, a complex ownership structure for various businesses can lead to deficit in managerial oversight. But in the case of Network 18 their businesses at a very fundamental level were struggling to make ends meet. The more likely reason was the weaknesses of individual businesses and their contribution to dragging the entire Group down. The Group made some bad investment choices. By March 2012, it had acquired interests in a number of businesses spanning television, internet, films, magazines, mobile content and allied businesses news, general entertainment, digital content, digital commerce and allied businesses that ranged from publishing a business directory to conducting sporting events. Within television, they had both news and entertainment. And of course news was not confined to general news but extended into business and financial market news as well. All of this was captured in in both English and a host of regional languages. Chart 1 above gives an overview of the different businesses that they were engaged in. The problem was not one of multiple businesses per se but the role of some of the biggest investment bets that the Group took and how it impacted the overall finances. When Network 18 decided to venture into general entertainment business through a 50:50 joint venture with Viacom Inc. it was a high-stakes gamble. It certainly drained a lot of cash, and the initial years were a bit of a struggle. This was best exemplified by the joint venture’s performance in 2011-12. In that year, TV18’s share of losses from general entertainment channels operated by the joint venture, worked out to Rs 93.07 crore. But the following year (2012-13) there was just the faint glimmer of a turnaround with the deficit getting reduced to Rs 36 crore. The fiscal 2013-14 even marked a turnaround in its fortunes with TV18 registering a profit of 26.88 crore as its share of profits from the joint venture. The company did even better in 2014-15 with its share of profits going up to Rs 84.25 crore. In 2015-16, the latest year for which audited figures are available, the company took credit for a net profit after tax of Rs 96.72 crore. Historical earnings are typically valued at a multiple of 18 to 20 by the stock market. By that yardstick TV18’s investments in the joint venture would be worth more than double its aggregate investment at Rs 1740 crore or more. It has taken a while. But what an investment it has turned out to be. But take another big ticket investment that the Group undertook. TV18 Home Shopping Network was started in 2006 and sustained in the boom years that followed. In the 10 years (2007-08 to 2015-16) that it has been in operation the company has accumulated losses to the tune of Rs 765 crore. TV18 Home Shopping Network, though an Indian company, is actually a wholly owned subsidiary of NW 18 HSN Holdings Plc, a company incorporated in Cyprus. NW 18 HSN Holdings is a joint venture between Network 18 Holdings and SAIF Partners, a venture capital firm with the latter holding a 47% stake in the venture. Network 18 Holdings (a wholly owned subsidiary of NMIL) itself started its corporate journey as a Cayman Islands incorporated company, had a change of mind later and became a Mauritian company. With investments shrouded behind jurisdictions which pride themselves on minimum corporate disclosures as their selling point, Network 18’s exposure to the home shopping channel business has not been easy to ascertain. But if the losses of Rs 765 crore are anything to go by, then sizeable sums of monies stand invested. The Indian Film Company (TIFC) is another one of those businesses where the erstwhile management faced some serious questions. TIFC was incorporated in Guernsey (an island located on the English Channel and known for its laissez faire approach to corporate law) as a wholly-owned subsidiary of NMIL in April 2007. The Group invested 10 million GBP in the venture as equity. That translated into an investment of Rs 80.78 crore in Indian currency. Then it raised five times that money in the Alternative Investment Market of the London Stock Exchange - a sort of ‘no questions asked’ kind of market place. With the stock price of TIFC languishing in the London market, NMIL saw an opportunity to mop up all floating shares in the hands of the public, possibly in the hope that it could hawk them to a prospective investor as a total stake or at best a 50:50 joint venture. It succeeded eventually and it also became a pyrrhic victory of sorts. This is what happened. NMIL first announced through its Cayman Islands incorporated subsidiary Network 18 Holdings that it was making an open offer to buy out the public shareholders and thereby increase its stake in TIFC to more than 76%. It appears to have succeeded quite handsomely. NMIL had by then set up a joint venture (50:50) with Viacom for launching a general entertainment channel (Colors). It succeeded in persuading Viacom to get the Indian joint venture company, Network 18 Viacom Private Limited, to float a 100% subsidiary and buy out the 100% stake in TIFC. The logic was that with 100% ownership of the film company, the intellectual property in the form of copyright to the entire library of films would belong to the joint venture and thereby feed the entertainment channel with feature films in its inventory. Thus Roptonal Limited, a Cyprus-incorporated company, was first set up which then made an offer to buy out the entire public shareholding in TIFC. By this time NMIL and its Mauritius subsidiary had become 100% stakeholders in TIFC. It is a mystery as to how a Mauritian subsidiary came into the picture because, all along, the investment in TIFC was held through a Cayman Islands company. Presumably, they obtained it from the Cayman Islands incorporated Network 18 Holding. Or perhaps the Cayman Islands company simply changed its domicile, the details of which are not very clear at this stage. But the important point is that Roptonal now became 100% owner of the entire film library of TIFC. But if NMIL investors thought they had escaped lightly from a costly misadventure, they would soon find that there was a catch and one that would come to haunt NMIL very shortly. The agreement between Roptonal and Network18 stipulated that the latter would indemnify Roptonal against the amount, if any, by which the net cash generated by TIFC from its existing film library during the period from the date on which they sold the stake to Roptonal and 21 July 2014, was less than the net asset value of the film library assessed at the time of the stake sale. Network18 Holdings also agreed to indemnify Roptonal against certain Indian tax liabilities that could potentially arise in the hands of TIFC or Roptonal (everyone had by then heard of Vodafone’s tax problems!). The agreement further provided that if Network18 Holding did not undertake the indemnity obligations agreed in the agreement, the indemnity would be provided by NMIL, the parent company. The new management, hand-picked by Reliance, reckoned in 2014-15 that the cost of such indemnification in its finances would be as much as Rs 217.26 crore (from the Annual Report of NMIL 2014-15, page 111). The Indian Film Company may have come up with some Bollywood hits, but for the investors, the emotional satisfaction of being part of that success came at a great financial cost. * The author is an editorial consultant with The Hindu Business Line.